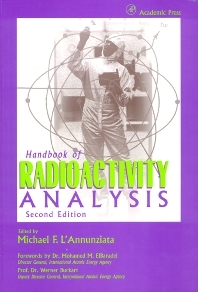 The book describes the preparation of samples from a wide variety of matrices, assists the investigator or technician in the selection and use of appropriate radiation detector, and presents the latest state-of-the-art computerized and automated methods of analysis. The new Handbook of Radioactivity Analysis is suitable as a teaching text for university and professional training courses. Of interest to those working in a wide spectrum of disciplines, including: scientists, engineers, physicians, and technicians involved with the preparation, utilization, or disposal of radioactive materials and the measurement of radioactivity in the environment. University students and laboratory researchers in the chemical and biological sciences. Scientists in research institutions in the pharmaceutical, chemical, and biological sciences. Nuclear power plants. Departments of Health Physics. Environment and waste management organzations. Atomic energy organizations. Introduction: Nuclear Radiation, Its Interaction with Matter and Radioisotope Decay. Gas Ionization Detectors. Solid State Nuclear Track Detectors. Semiconductor Detectors. Liquid Scintillation Analysis: Principles and Practice. Environmental Liquid Scintillation Analysis. Radioactivity Counting Statistics. Sample Preparation Techniques for Liquid Scintillation Analysis. Cherenkov Counting. Radioisotope Mass Spectrometry. Solid Scintillation Analysis. Flow Scintillation Analysis. Radionuclide Imaging. Automated Radiochemical Separation, Analysis, and Sensing. Radiation Dosimetry.